14k gold custom made 3 stone ring consisting of round shape, natural diamond, weighing 1.43 - 1.48 carats, having a I color and SI2 clarity, according to GIA grading scale. The center stone measuring 7.33mm x 7.36mm x 4.50mm. 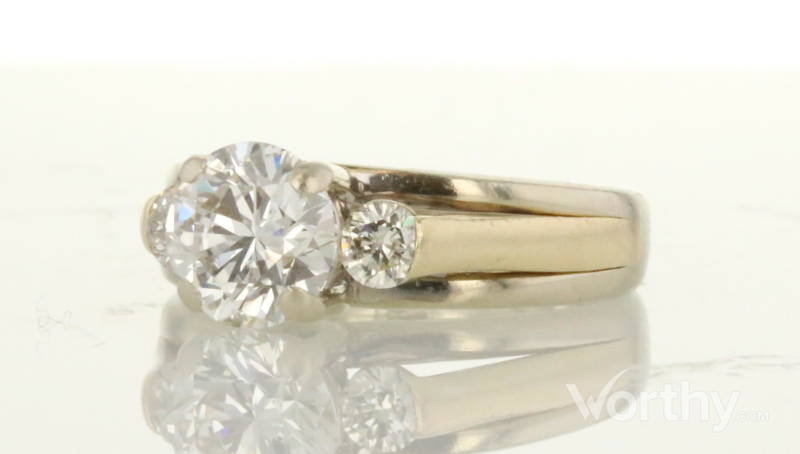 All surrounding diamonds are genuine with a total carat weight (cttw) of 0.3 carats. Inclusion Description: The grade making inclusions are: an indented natural located in the crown that has radiating feathers, and a medium sized transparent crystal that is located outside the table in the crown. There is an eye visible indented natural cluster located near the culet in the pavilion that is eye visible.